The perfect introduction for anyone just discovering the baritone guitar! 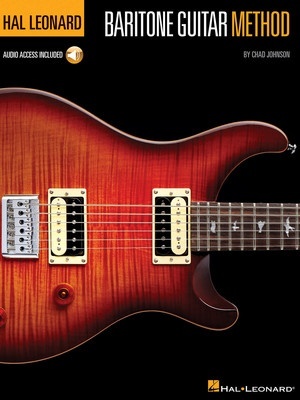 This easy-to-use book and audio pack also functions as a crossover method for folks who already play standard guitar or bass guitar. Includes many useful exercises, popular songs in a variety of genres, invalubale tips, and full-band demonstration audio tracks online for download or streaming. Lessons include: tunings, chords & scales, strumming & arpeggios, rhythm tab notation, a variety of styles, and more. Songs include: Back in the Saddle (Aerosmith) • Bonnie Came Back (Duane Eddy) • Crazy (Patsy Cline) • Invisible (Metallica) • Lie (Dream Theater) • Rock Lobsters (B-52's) • The Space Between (Dave Matthews Band) • and more.